Precipitation reactions are when two liquids combine to form a solid, known as a precipitate. A similar reaction can occur between two gases to produce a solid, and is also considered to be a precipitation reaction. Click on the video to see one of the most colourful examples, however most of the time precipitates are white and cloudy. Having knowledge of precipitation reactions to predict when they will occur is a powerful tool in extraction of metals and salts from solution. If you know what ions are present, then you can design a series of precipitation reactions to extract the specific one that you want. For an example of this in action click to see the extraction and quantification of sulfate in fertiliser experiment. Let's examine a precipitation reaction that occurs within aqueous solution. A solution is formed when a solute (in this case a salt, like CuSO₄) is dissolved in a solvent (water). The water molecules are small, and have polar regions which have a slight positive and negative charge on either side which enables the molecule to move between and surround the ions, stick to their charges, and separate them (Taylor, 2007, p.294-295). Salts are ionic compounds; compounds that are made out of Cations (positively charged ions), and Anions (negatively charged ions). When the water molecules move in between the ionic bonds, these cations and anions separate from each other. This process is known as dissociation (Taylor, 2007, p.295). This means, that when any combination of salt solutions are mixed, these compounds exist in their dissociated form as ions. Ions remain in solution (meaning, dissolved in water) because the attraction forces between the ions and the water is greater than the attraction forces between the ions and other ions. Conversely, ions will come out of solution (forming a precipitate) if the attraction forces are greater between the ions and other ions. This is like a situation where your family (mum, dad, brothers and sisters) may dissociate from each other and mingle when at a family barbecue - whether you choose to stick together or not depends on how much you like to hang out with the other people there. But how can we check whether the ions present in our mixture of salts like to hang out with each other more than with the solvent? Tables of data have been collected from many experiments of all sorts of combinations of ions such that we can simply look them up to determine whether any of the ions present will produce a solid. 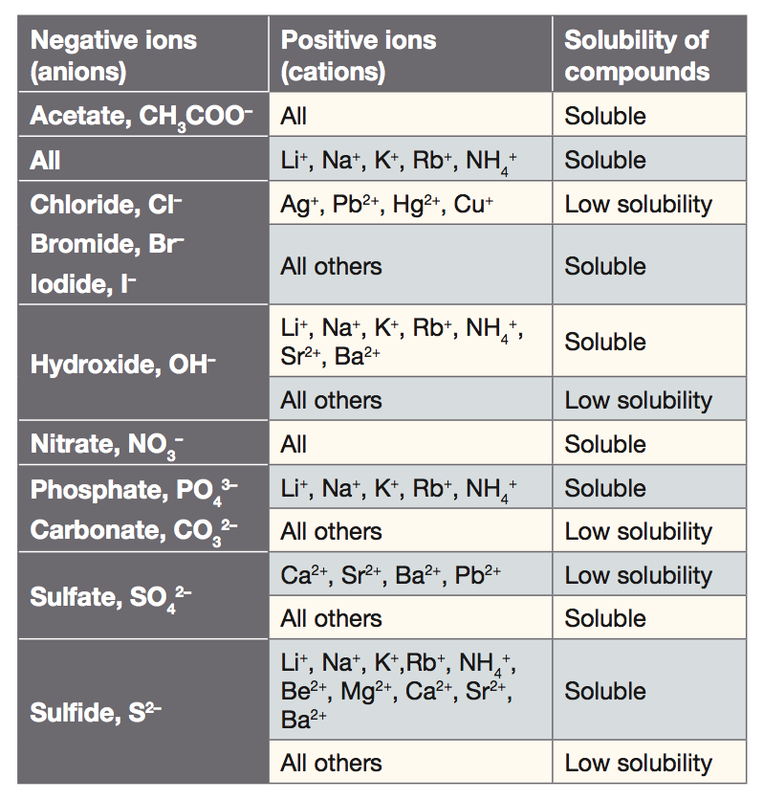 These are known as solubility tables of ions. Let's look at our example mixture earlier, NaCl + CuSO₄, but this time the physical states (solid, liquid, gas, aqueous) have been removed temporarily from the products until we can be certain of their solubility. Having narrowed down the possibilities, let's look these up in the table. Sodium Sulfate contains the sulfate ion and looking across the row on the table from figure 1, sulfates are soluble with anything except when combined with calcium, strontium, barium and lead cations. So Sodium Sulfate will remain in solution. Copper chloride, the other possibility, we read the row on the table for chlorides and find that they are soluble in anything except when combined with silver, lead, mercury, or copper cations. So Copper chloride will also remain in solution. Now that all possibilities have been ascertained, there will be no precipitates formed, and hence no reaction would occur to change their chemical composition. So our original example from above was correct in stating that all the ions are aqueous. Now we consider the solubility table (figure 1) to determine whether NaNO₃ or AgCl are have low solubility to form a precipitate. According to figure 1 all nitrates are soluble so therefore NaNO₃ is soluble; we write this as NaNO₃ (aq), or as their dissociated form Na⁺ (aq) + NO₃- (aq). According to figure 1, chlorides (Cl⁻) have low solubility when combined with Silver, Lead, Mercury, and Copper cations, therefore AgCl will form a precipitate. We write this as AgCl (s) to show that it has formed a solid. where AgCl is the precipitate! At this point, you may have noticed that the products look very similar to the reactants, only that the anions have swapped partners. Sodium (Na⁺) has swapped its Chloride (Cl⁻) partner for a Nitrate (NO₃⁻) partner instead, and similarly the Silver has swapped the Nitrate partner for a Chloride ion. This observation can save you some time because if there is any reaction occurring at all, then the anions will have exchanged places - simply look these products up on the solubility table and determine whether they are soluble or not. Sodium Sulfate is not NaSO₄, because each sodium ion carries 1+ charge, and each sulfate ion carries 2⁻ charge. There needs to be twice as many sodium ions as sulfate ions to balance this out, so the correct formula for sodium sulfate is Na₂SO₄. Linstead, G, 2011. Pearson Science 10 Student Book. 1st ed. Melbourne: Pearson Australia. Taylor, N, 2007. StudyON Chemistry 1. 1st ed. Brisbane: John Wiley & Sons Australia Ltd.